What is Private Internet Access? Private Internet Access is a company from US that offers you VPN services. The US state is under the draconian laws, meaning that you are limited about things you can keep in your computer. But with this company – Private Internet Access – you have a high level of security and you can work as an anonymous person. Private Internet Access offers you the benefit of being anonymous, an amazing connection speed and also helps you use their own service with the help of numerous guides. They have a package that is suitable for everybody, with low prices. This company uses 256bit OpenVPN encryption which means your data is very well protected. The package offered by Private Internet Access offer costs just $6.95 per month. Of course you can save some money and buy a yearly package with $39.95. In this way you will have to pay only $3.33 per month. 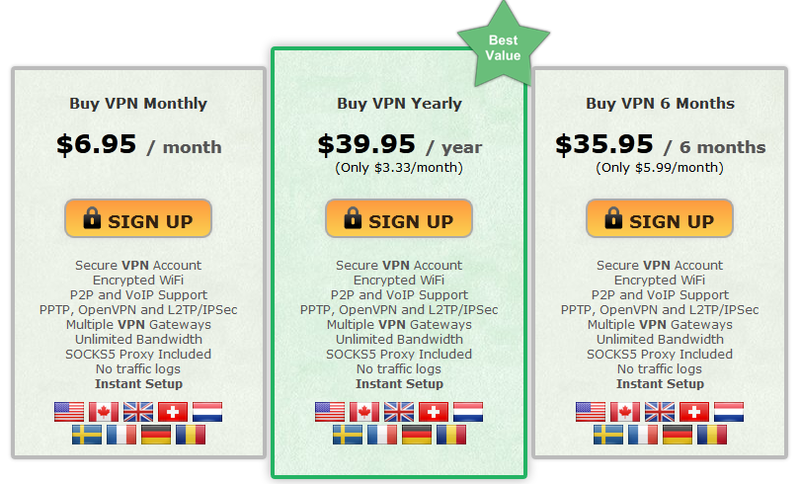 If you choose to buy VPN for 6 month, this package cost $35.95. This means you about $5.99 per month. As you can see you can make some important savings if you choose the long term pack. 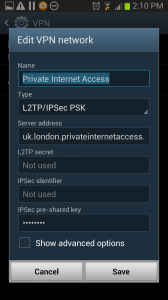 This package uses OpenVPN PPTP and L2TP IP Sec. For connection, you need to choose a server from 9 countries. Also, they use Socket5 Proxy and this is very important because it allows you to surf anonymously. A small disadvantage that needs to be taken into consideration is that company doesn’t offer you a free trial and also they don’t return your money if you don’t like their services. This company has a friendly website that is clear and very easy for you to use. On the webpage you will find a nice promotional video, some information about VPN, about what it is, about their company, what they offer to you and how you can use their services. Also if you have some problems with connection or you don’t know what you have to do, Private Internet Access offers you online assistance. You can send them an email or if you want an instantaneous answer you can use the chat. Everything is simple and the online assistance is very efficient. The Private Internet Access has the base in US. They don’t keep information about what you do on the internet. Also they use dynamic IPs so it is impossible to know for a particular user what he did on the internet. So, you can be sure to have all the possible security. Also, Private Internet Security has two big advantages: if your VPN connection fails, your connection on the internet is interrupted and the client has a DNS protection. These two advantages are very important for you, for your identity. In conclusion, this company offers all the users maximum protection and a high level services for all of you. The signing up process it is very simple. Everything it`s clearly explained but if you have problems you can give them an email or talk to them on live chat. One of the first steps consists of choosing the method you want to pay for their services. Also you will have to use an email to confirm all the procedure. 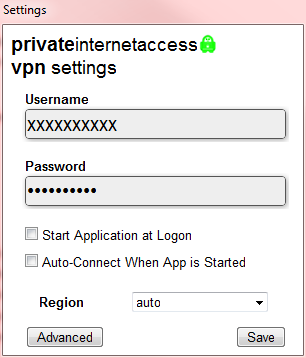 In a few seconds you will receive in your inbox an email, and then you will be able to download the VPN client for Windows. Installing client comes easy. The Private Internet Access makes your life easier and when you download the client from the link found in your email, your username and password are already completed in the box. So, less work for you. Also you have a button with Advanced Settings. The Advanced settings let you to so some modifications like connection type and remote port. 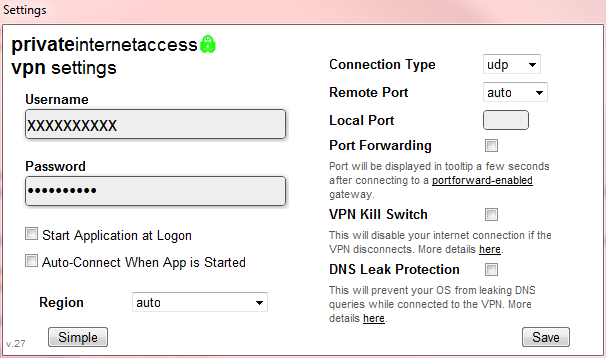 You can check the box to have DNS Leak Protection or VPN Kill Switch. 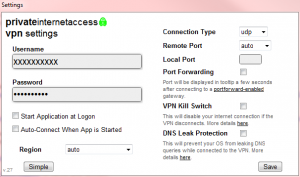 The VPN Kill Switch disables your internet connection if the VPN disconnects. The DNS Leak Protection prevents your OS from leaking DNS queries while connected to the VPN. After you make all the settings, press the button ‘Save’ and the little icon will appears in your task bar, on the right side. On the next step you need to choose a server. If you don’t choose, the Private Internet Access will choose for you. And this is all, your connection it is ready to be used! 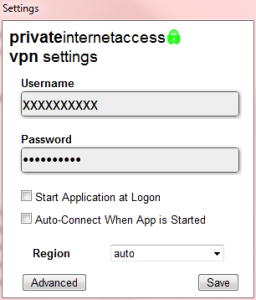 Private Internet Access lets you to use their services on Windows, OSX, Android, Boxee Box for PPTP; iOS, Android for L2TP/IP Sec and Windows, Android version 4.0, OSX, Tomato for OpenVPN. We performed all these steps and then we decided to go for a speed test. As you can see, the results were very impressive. No track of clients’ internet activity, such as log files etc. Great results on performed tests. There are several things that need to be taken into consideration when opting for a VPN service: the anonymous surfing, the speed of connection and the easiness of use. We are glad to say that Private Internet Access offers all these 3, even though there is room for improvements. It’s a pretty fair deal.